1918: Local citizen formed the Crozet Free Library Association and opened Crozet's first free public library at John T. O'Neill's store north of the train depot. 1923: Management of the library was assumed by the Woman's Club of Crozet. The library was moved to their clubhouse in 1928 after its construction. The library moved several times during the next two decades to accommodate growing public use. 1963: The Crozet Lions Club held a meeting to discuss the need for a formal public library building in Crozet. 1964: The first publicly-funded Crozet Library opened in a small building across the street from the train depot. Cue to the need for more space, Crozet library moved to what is now Crozet Hardware and then to 5792 Three-Notch'd Avenue, also the former location of the Green Olive Tree. 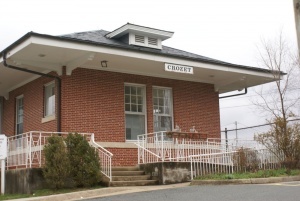 1984: The Crozet Library moved into the brick train depot, which was purchased and restored by the Perry Foundation. Public use of the library more than doubled during the 1990's. 2001: Albemarle County funded a study to determine library needs throughout the county. The study recommended that, due to population growth and increases in library use, Albemarle County's highest priority should be a new library in Crozet. 2004: Albemarle County's Crozet Master Plan established a new and expanded public library in downtown Crozet as a critical priority. 2012: Construction of the new Crozet Library began. The community requested a new library for many years and codified the request in the 2004 Crozet Master Plan. The Board of Supervisors approved construction of a 20,000 square-foot building in March 2007, and appropriated just under $10 million in capital funds. The original estimate for construction was $9.8 million. The new library is set to open in the fall of 2013. The current library houses 30,000 books; it is expected that the new facility will house over 75,000 volumes a year after it opens. In 2013, the Crozet community raised funds to pay for library computers and furniture, including a locally crafted circulation desk. Funds for new books were still being sought. The first floor of the new library will be leased, at least temporarily. In July 2013, the Albemarle Board of Supervisors approved a plan to use the space for an 'Outdoor Adventure Visitor Center,' which will aim to boost tourism in Crozet, feature history and artisan displays, host visits from park rangers, and provide information about the region's parks and trails. Construction had been scheduled to begin in spring 2010 with completion in 2011. However, the County's budget constraints removed the project from the Capital Improvement Program. The county was asked to advance close to $300,000 for final design so that a fundraising campaign could begin. Even though a construction date had been delayed, plans still made their way through government. The Architectural Review Board awarded a Certificate of Appropriateness for the library on April 4, 2011. In July 2010, the firm Dominion Library Associates was hired to conduct an assessment of the Crozet, Scottsville, Louisa County and Nelson County facilities. The Crozet library was deemed to not be in compliance with the Americans with Disabilities Act and "is the most crowded facility attempting to provide library service that this consultant has seen in recent years. The report called for the library to be shut down until a safer one could be opened. JMRL director John Halliday said that the study was commissioned for $2,000 and was a routine study called for in the library's five-year plan. Supervisors are exploring ways to find a temporary structure to serve as an interim facility while the county saves money to build a permanent one. Albemarle County Executive Bob Tucker's proposed budget for FY2011 included a 5% reduction in funding to JMRL. As a result, the library's Board of Trustees chose to reduce hours at the Crozet branch as a partial way to make up the shortfall. A community group called Save Crozet Library formed in order to boost support for the library. As the staff began to prepare the budget for FY2012, proponents said they hoped to raise capital funds in the county's budget to pay for the project. Under one scenario, a 2 cent increase in the county's tax rate could help pay for the project. That prompted the Board of Supervisors to vote unanimously on December 7, 2011 to issue a request for proposals for construction firms to build the library. The decision is dependent on whether the board voted to adopt a higher tax rate for FY2013. The Board of Supervisors voted on December 7, 2011 to put a request for proposals together for the project, pending confirmation that the money for the project can be allocated. Bids for the project were opened on March 28, 2012. In all, eleven companies submitted a bid. The lowest was a $5.77 million proposal from MB Contractors of Roanoke. The Board of Supervisors will decide on April 4, 2012 whether to move forward with the project. If they agree, a contract will be awarded in May and construction could begin in summer 2012. The Albemarle County Board of Supervisors set a $76.2 cent tax rate for FY2013, which will allow for the construction to go forward. Supervisors accepted a $5.81 million bid for the library to MB Contractors Inc. of Roanoke. Supervisor Ken Boyd voted against the bid because the expanded facility will be more expensive to operate. To help pay for furnishings in the new library, the Crozet Mudhouse sold a special blend of coffee grounds with $2 from each pound sold. On June 26, 2012, a groundbreaking ceremony was held at the site of the new library. Supervisor Ann H. Mallek emceed the ceremony which included remarks from County Executive Thomas C. Foley, Tim Tolson, Bill Schrader, and John Halliday. ↑ 1.0 1.1 Web. New Crozet library opens, Aaron Richardson, Daily Progress, World Media Enterprises, September 4, 2013, retrieved September 5, 2013. ↑ Web. Human Chain to Move Last Books from Old to New Crozet Library, Allie Pesch, Crozet Gazette, Crozet Gazette, August 3, 2013, retrieved August 6, 2013. ↑ Web. Crozet turns out for new library & other school news, Tim Shea, Charlottesville Tomorrow, September 3, 2013, retrieved September 3, 2013. ↑ Build Crozet Library. "Crozet Library Groundbreaking." np. Crozet Library Groundbreaking, 26 June 2012. Program. ↑ Web. Supervisors seek lower construction costs for Crozet Library, Sean Tubbs, Charlottesville Tomorrow, May 08, 2008, retrieved 6 Oct 2009. ↑ 6.0 6.1 Web. New Crozet library could come sooner with donations, grants, Brandon Shulleetta, Daily Progress, World Media Enterprises, November 25, 2010, retrieved November 29, 2010. ↑ Web. Community steps up for new Crozet Library, J. Reynolds Hutchins, Daily Progress, World Media Enterprises, 1 June 2013, retrieved 8 July 2013. ↑ Web. Crozet Library to include tourism center, Andrew Quarles, Charlottesville Tomorrow, 5 July 2013, retrieved 8 July 2013. ↑ Web. Supervisors approve preliminary design of Crozet Library, Julia Glendening, Charlottesville Tomorrow, June 03, 2009, retrieved 6 Oct 2009. ↑ Web. ARB Approves Library Design, retrieved April 12, 2011. ↑ Shulleeta, Brandon. "Crozet Library -- Unfit for Use? | Daily Progress." Home | Daily Progress. 3 Sept. 2010. Web. 08 Sept. 2010. <http://www2.dailyprogress.com/news/2010/sep/03/crozet-library-unfit-use-ar-486665/>. ↑ Web. County staff sees light at the end of Crozet Library's tunnel, Aaron Richardson, Daily Progress, World Media Enterprises, November 9, 2011, retrieved November 10, 2011. ↑ 17.0 17.1 Web. County votes to issue request for proposals on Crozet Library, Aaron Richardson, Daily Progress, World Media Enterprises, December 7, 2011, retrieved December 8, 2011. ↑ Web. Contractors bid on Crozet Library, Aaron Richardson, Daily Progress, World Media Enterprises, March 29, 2012, retrieved March 29, 2012. ↑ Web. Albemarle approves less-than-equalized tax increase, Aaron Richardson, Daily Progress, World Media Enterprises, April 4, 2012, retrieved April 10, 2012. ↑ Web. County accepts lowest bid for Crozet Library, Aaron Richardson, Daily Progress, World Media Enterprises, retrieved April 10, 2012. ↑ Web. Mudhouse Launches 'Build Crozet Library' Brew, Kristin Twiford, NBC29, October 21, 2012, retrieved October 22, 2012. This page was last edited on 5 September 2013, at 12:19.